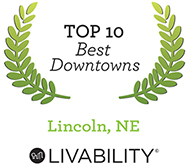 Downtown Lincoln was recently named a Top 10 Best Downtown of 2015 by Livabilty, which highlights its Top 10 Best Downtowns list on livability.com. Livability editors looked at more than 2,000 cities across the country, and recognized Downtown Lincoln as the eighth best Downtown among small-to-medium-sized cities. Livability’s analysis took into consideration increasing housing values and populations to find cities that are growing and thriving. They looked for areas with new construction, a vibrant arts scene and walkable streets. 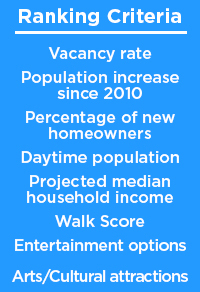 According to Livability, Downtown Lincoln met much of this criteria. “Historic buildings, wide streets, shops and restaurants make Downtown Lincoln an attractive destination for the young, creative types who continue to move to this Heartland city." Specifically, Livability recognized Downtown Lincoln for its recent completion of the P Street District enhancements, the creation of Innovation Campus, and its Historic Haymarket District. Livability also recognized the Downtown Lincoln Association for its green practices. Livability is one of the leading online resources used for researching communities. For over 25 years they have worked with hundreds of communities developing content marketing programs. During this time, they have published monthly and annual lists of cities, defining the best places to live in America and serve as trusted partners to cities, businesses and economic development organizations nationally.